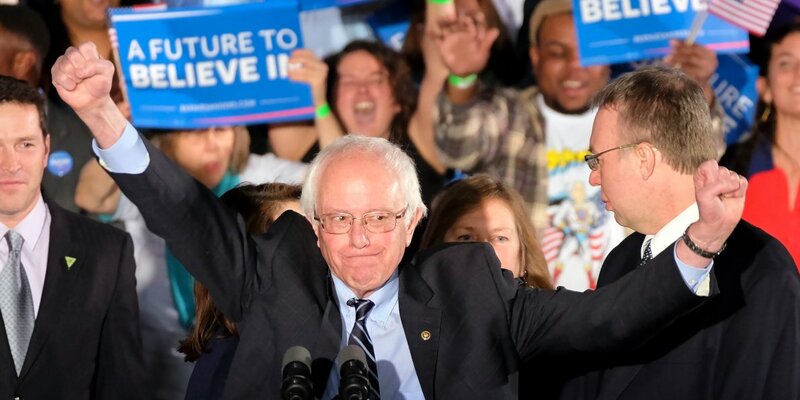 Vermont Sen. Bernie Sanders has defeated Hillary Clinton in Oklahoma's Democratic primary, winning a contest that the former secretary of state had picked up eight years ago. Sanders drew large, enthusiastic crowds in two recent visits to Oklahoma City and Tulsa, and both candidates made television ad buys in the Sooner State. In 2008, Clinton won the Oklahoma presidential primary but eventually lost the nomination to Barack Obama. Former President Bill Clinton stumped for his wife in Oklahoma twice in the last two weeks, including events Saturday in Tulsa and Edmond. Oklahoma has 38 pledged Democratic delegates and four super delegates not bound to any one candidate. Presidential candidates on both sides of the aisle hope a flurry of last-minute campaign stops and television ads in Oklahoma pays off with a win in a state that Republicans like to brag is the "reddest of red." GOP candidates Ted Cruz, Donald Trump and Marco Rubio all hosted campaign stops in Oklahoma in recent days ahead of Super Tuesday, the biggest single-day delegate haul of the nomination contests when voters in 12 states cast votes for party nominees. And Vermont Sen. Bernie Sanders returned to Oklahoma last weekend for his second rally in as many weeks, hoping to take advantage of registered independents allowed to vote in the Democratic primary for the first time in state history to notch a win over fellow Democrat Hillary Clinton.